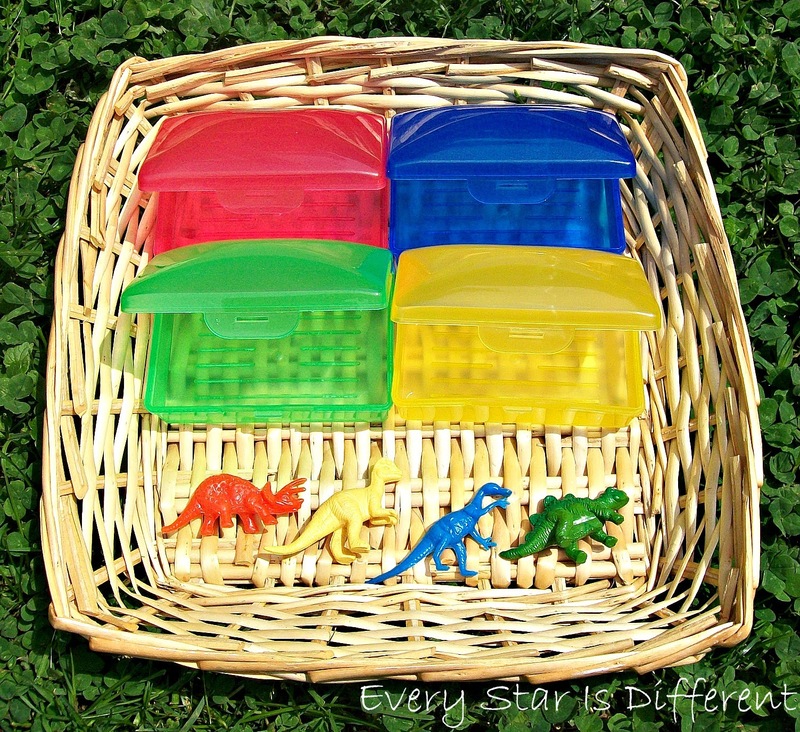 Sunshine's dinosaur tot activities are on the shelves for this week. You'll notice some are quite different than in the past, as I'm trying to learn her preferences and test out new ideas. Sunshine will attempt to use the dot marker to place dots in the circles provided. I have made them a little larger, as she struggles with accuracy. 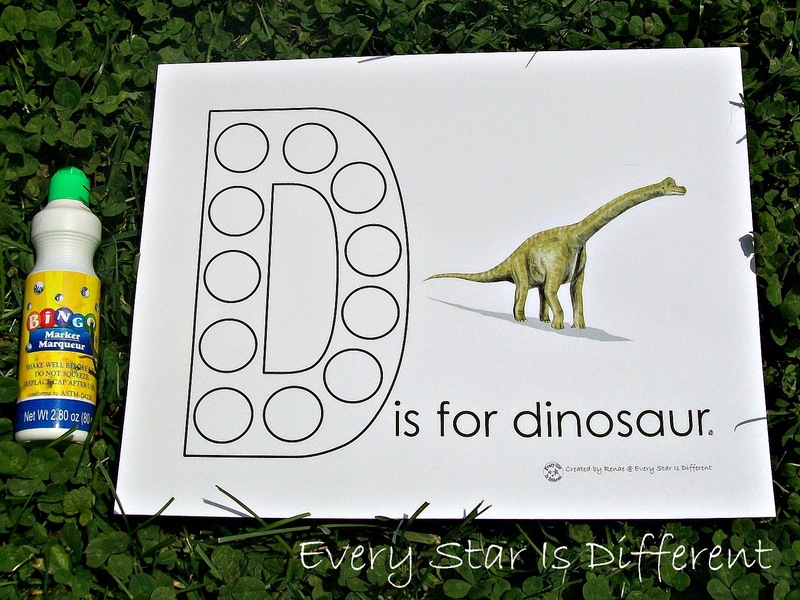 Source: I created this this printable as part of the Dinosaur Unit for Tots Printable Pack I. For your free copy, click on the link at the bottom of this post. I need to confess, I am not a crafty person. 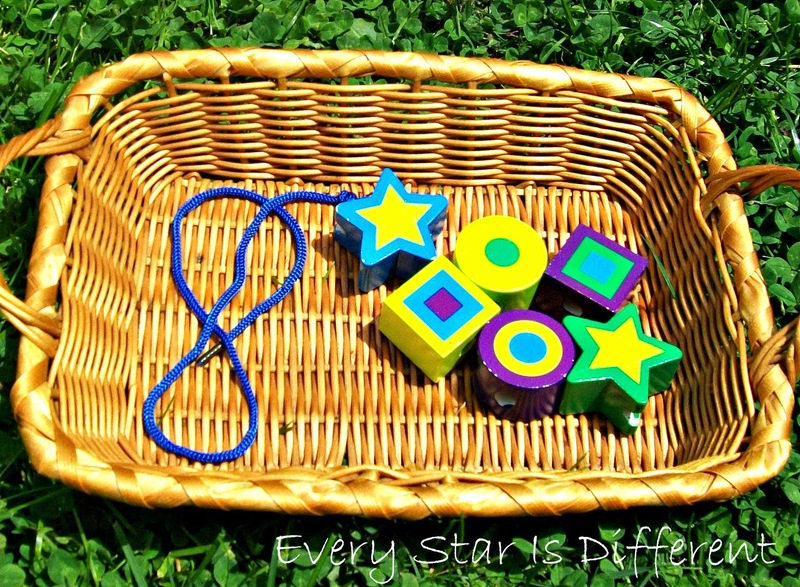 There are so many fabulous ideas out there that involve elaborate and detailed activities. Most require sewing, which is NOT my thing. So, instead you have painted cardboard cut outs with painted clothes pins. As I was painting the pieces, I realized it would have been so much easier to just create a Stegosaurus printable, print it on card stock, and laminate it. Oh well. The thing is, when I saw an idea similar to this (without the numbers), I thought it was super cute and just had to try it. Sunshine is still having no luck with her counting and number recognition. (Sigh.) Even if she doesn't pay any attention to the numbers or wants to count clothespins with me, she can at least have fun sticking the clothespins on the dinosaur cut outs. Opening and closing the clothes pins will be a great fine motor activity for her to help improve hand and finger strength. Source: The idea for this activity came from No Time for Flashcards. Sunshine isn't the greatest when it comes to using a glue stick. Her coordination needs some improving. I'm hoping this activity will help that, along with her fine motor skills. She will glue the triangle teeth provided into the mouth of the dinosaur. A special thanks to my husband for drawing the outline. Drawing is not something I do very well either. Source: I found the idea for this activity on Pinterest, however it was not attached to a link, so I'm unable to source any further than that. Sorry. Sunshine is obsessed with opening and closing anything she can get her hands on. All week I was looking for colorful containers that would be easy enough for her to open and close on her own. It turns out soap containers are pretty easy. Sunshine is still unable to identify any of her colors, but she does have success with matching. She will match up the correct dinosaur and soap container, placing the dinosaur in the soap container and closing it. I'm hoping, she'll enjoy this activity and that it will keep her attention for more than 2 minutes. Dinosaurs for this activity are part of Dinomite's very large collection of figures. As with all activities, Sunshine will be supervised closely. The dinosaurs are quite small. Sunshine will attempt to string the beads provided. If the string proves to be difficult, I will offer her a pipe cleaner. After taking a picture of this activity, I realized if I had wanted to be really crafty, I could have made dinosaur teeth for her out of salt dough, baked them, and had her string those, but... I decided these will work just as well. 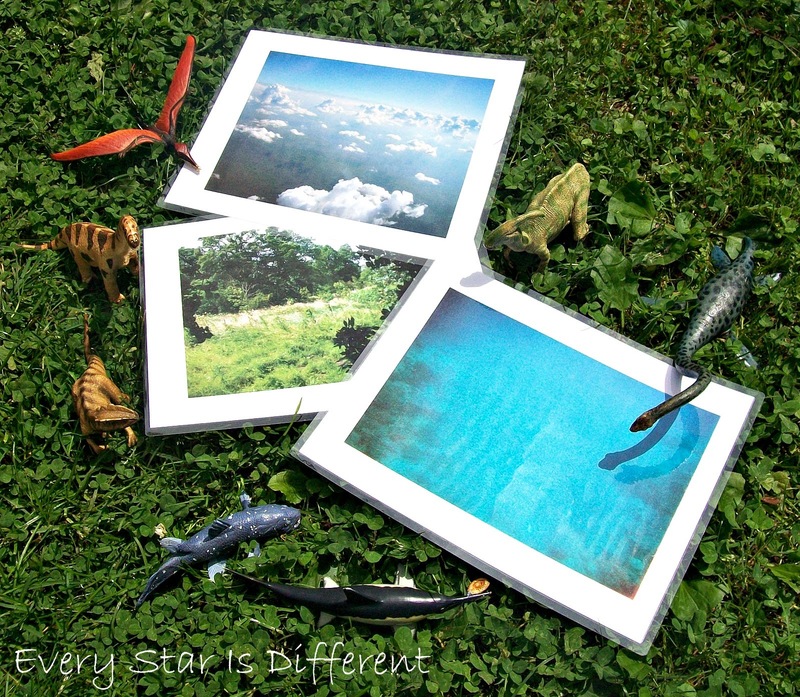 Sunshine will sort the air, land, and sea prehistoric creatures,. placing them on the correct mats. With a little help, I'm hoping she'll engage in some pretend play. 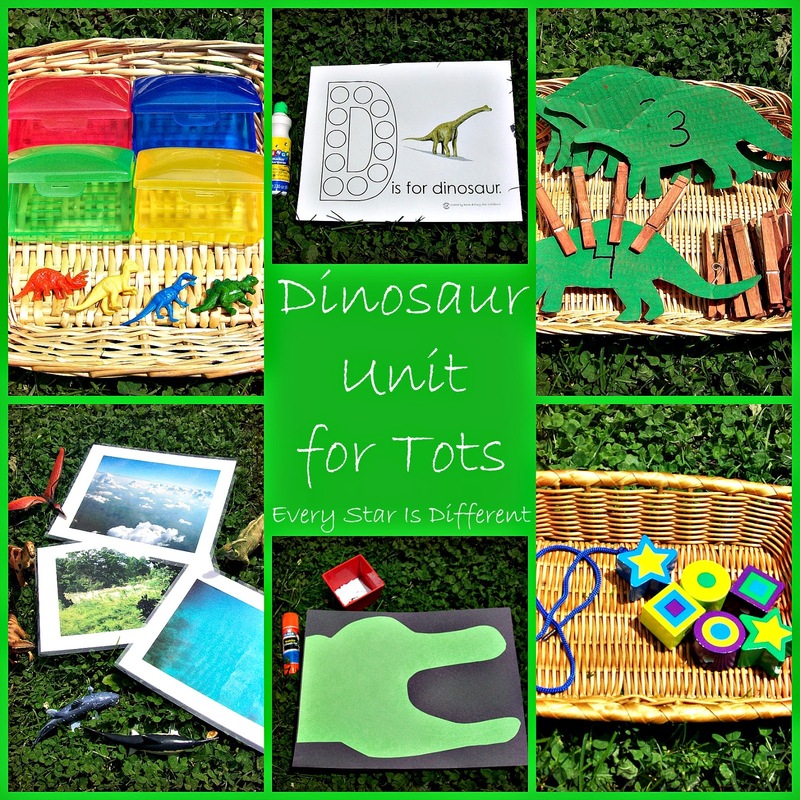 Source: I created the mats provided for this activity as part of the Dinosaur Unit for Tots Printable Pack I. For your free copy, click on the link at the bottom of this post. I'm a huge fan of Laurie Berkner. She has a really fun song, "We Are the Dinosaurs" to dance to, that will help develop gross motor skills (if you get creative). I'm certain Sunshine will love it, as she responds quite well to music and dancing. Source: Click here to see the video link of the song. For those interested in the printables, click on the link below. If you haven't already, please join us on facebook, Pinterest, Twitter, and/or follow me here on the blog. I love reading your comments! Who doesn't LOVE dinosaurs? And as an Art Educator myself, I really like the way you've incorporated the different learning aspects with fun and attention keeping activities. I'd love it if you'd stop bye and share this post on our Caffeinated Crafter's Link Party. Will do. Thanks for reading and sharing. Exciting stuff. So glad you like this unit. Love the ideas! We've done dinosaurs twice already but I have found so many good ideas since then that we may have to study them again. I will be sure to use some of these ideas if we do! Wonderful blog and very interesting blog i appreciate your information well done.